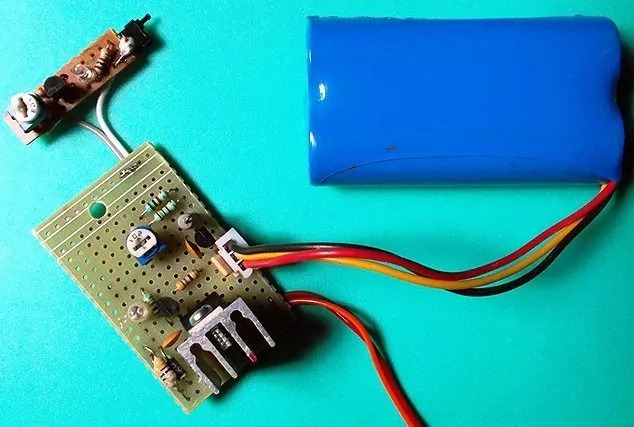 This is a simple and 100% safe universal linear charger module for 2S Lithium-Ion (Li-Ion) and Lithium-Polymer (LiPo) batteries with the recommended constant-current/constant-voltage (CC/CV) charging algorithm. Initially charging takes place in the current mode and after reaching the target voltage the charging goes into voltage mode. At the moment the current is small, the battery is charged. The typical target voltage of a 2S battery is usually 8.4V (note that target voltage is not the same as the nominal voltage as it is 7.4V typical). 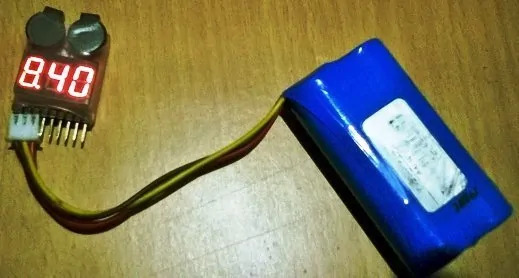 The design is optimized for batteries of 1000mAh or higher, and the input power source can be any linear/switch mode power supply capable of catering an output current of minimum 750mA at 12V. The electronics is in fact a perfect blend of one constant current source and one constant voltage source built around the popular adjustable 3-pin voltage regulator LM317T (IC1). Related capacitors (C1-C2) are added deliberately to increase the circuit stability by reducing possible unwanted noise. Rest of the electronics is a bunch of visual indicators and their supporting components. See the well-annotated circuit diagram included here for a deep perceptiveness. When the battery is fully charged up to 8.4V, the red LED switched off automatically to indicate a full-charge state. Charger circuit will automatically switched off too. Sometimes, a very faint glow in the LED might become visible. It’s not a fault, but the indication of a harmless leakage current; don’t care! At anytime during the charging process, user can test the condition of connected battery using the (optional) “BAT TEST” button. When the button is depressed, “BAT OK” indicator will lights up only if the battery is charged upto its nominal voltage (7.4V) or higher than the normal voltage (anywhere from 7.4V TO 8.4V). In short, this is a trustable notification, signalling the battery is healthy and ready for veritable service!